Bicycle Tasmania has moved to a beautiful NEW website. You are presently looking at the old one. If you follow that link and end up back here then you need to restart your browser. 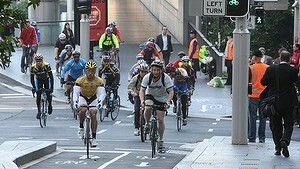 To promote the importance of improving bike infrastructure to ambitious Federal electoral candidates, BT is currently rolling out its 2013 electoral campaign. This includes a survey of all candidates for both House of Reps and the Senate, quizzing them about their level of support for bike riding, both in general and in their electorate. We are highlighting a number of infrastructure projects which are "shovel ready". What this generally means for these projects is that all the planning and consultation has been done, the project is now just waiting for the addition of funds for the final design stages and building to be undertaken. •	University of Tasmania Sandy Bay Campus to Hobart CBD bike trail. •	Upgrading the University of Tasmania Newnham Campus to Launceston CBD bike trail. We will publish the candidates' responses here and on our FB and blog pages, so stay tuned to find out who your best candidate for cycling is! Contact Alasdair Doyle on 0481154710 if you would like to help out with the campaign. We have recently updated our summary of the insurance cover that members get with their membership. We’ve also got more detail on options for covering your bike. Did you say that you have an electric bike? And more answers to the questions that you forgot to ask…. Click on "About Insurance". Bicycle Tasmania welcomes the decision of Hobart City Council to progress the Sandy Bay Walking and Cycling Project. It is a significant step in providing other transport options for residents in the Taroona and Sandy Bay areas. Several aldermen spoke of the importance of a connected bicycle network (Ruzicka, Zucco, Briscoe, Harvey, Burnet) because safe paths from destination to destination is what is needed to get most people riding for transport. Action on Sandy Bay Road Walking and Cycling Project is a vital step forward in achieving this connected network in the City of Hobart. Confident riders will be better serviced by the improvements to the road surface that will occur as a key part of the Sandy Bay Road project, but importantly, new riders will be attracted by the greater level of service provided by both the removal of hazards (poor pavement, grates, some parked cars) and the clearer delineation of space for bike riders. We look forward to working with Council to continually develop cycleway infrastructure in future. Bicycle Network Victoria has been campaigning for the connection for 17 years and last year the state government allocated $18 million to complete the project, including a route along the Darebin Creek and a new bridge across the Yarra.